Fishing Friends – This is turning out to be a very difficult July for Miramichi system salmon fishing. The temperatures since about July 10 – a handful of days accepted – have simply been too warm for decent salmon fishing. Thankfully it has not yet been too hot for salmon survival. Jason Curtis, who has one of the river’s best vantage points, has seen only 4 or 5 dead fish – there are always a few on even the coolest summers. I just came back from a few days of morning fishing and working on the camps, and I saw zero dead fish in my time there. What I did see was a few very much alive fish moving up the river very late in the day each day, but the water was in the mid 70s and they were just on their way to the next cold water pool. In the mornings the water was back down into the mid 60s, but there were very few fish showing, and the ones that did show were on the move. 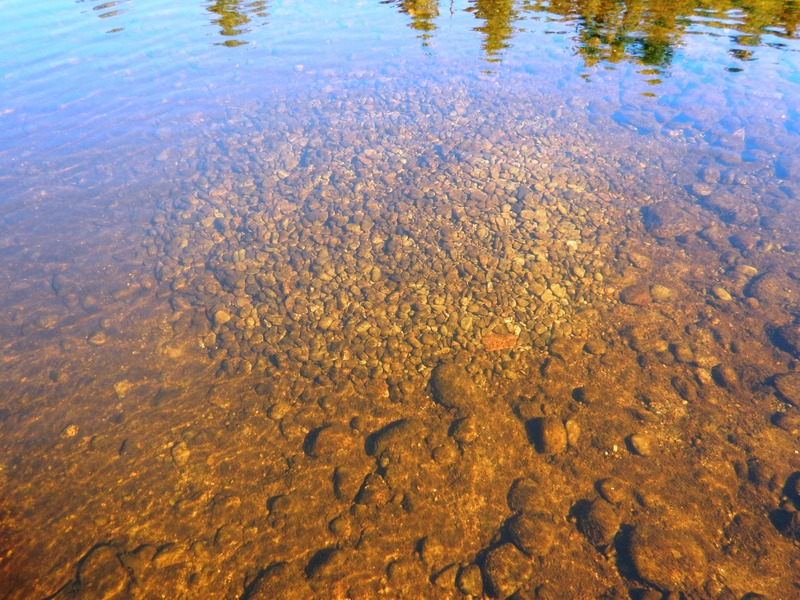 There have been some sporadic catches from some of the cold water pools, but in general it is slow fishing. Country Haven did tell me that one of their better pools down in the Rapids that used to belong to Ted Williams – no not White Birches – had produced well for them over the last week, so there are exceptions. Still the low grilse numbers so far are worrisome. That on top of the low returns in many Newfoundland Rivers is pause for concern about the possibility of yet lower sea-winter survival this past year. There is still time, so let us hope it all turns around. The double whammy with the temps has been the total lack of rain. One morning I was looking at one of the Chestnut canoes anchored just off the shore at Campbell’s in a foot and a half of water. It remind me of the advertisements for the Gaspe’s Bonaventure with the canoe and anglers seemingly suspended in air. This just isn’t the way things look normally on the Miramichi. 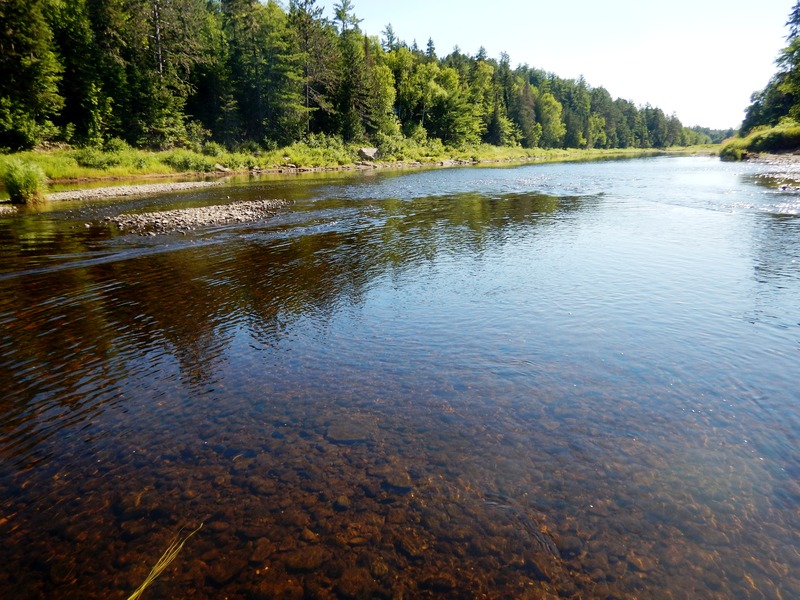 In addition to water clarity is the amount of it or “water level.” The river today is at .540 meters on the Blackville gauge. That is low, not record low, it can drop 4 inches or so from there under the most exceptional of conditions, but it is still very low, especially for July. The additional problem this presents is that the wide, relatively slow moving lower Miramichi heats up very quickly if beaten upon by the summer sun. The fleet is in port waiting for a raise of water. I try to remember that we are ground zero for most storms coming from anywhere across the United States. And that is what we need now – water! Unfortunately a big rain can not only bring in a lot of fish, but those fish may represent a big part of the year’s run, and send them through all at once. It happened in 2014 with Hurricane Arthur to the point that it blew out the Millerton trap. No salmon or grilse were recorded for almost two weeks. To be conservative and consistent the government only records those fish actually caught in the trap, so the official number was zero for the period. I was there, though, and it was by far the best fishing of the year. A half an inch or so every week would be far preferable to a deluge, but we get what we get. At this point we’ll just have to wait and see, but eventually we will get some rain. Yes, this is a redd, but according to the MSA’s Mark Hambrook it is a lamprey redd made back in June. An old saying which I have modified for my purposes “that man doesn’t live by salmon alone” is none the less true. My latest trip was 10% to fish a bit in the morning each day, and to keep watch over the river – and a nesting box full of bluebirds – during cocktails in the evening… Since I saw fish most evenings I also did a little evening fishing too, but I had no success. The other 90% was working on the upriver Cains camp and sniffing the breeze. A salmon camp located back in the woods some 40 miles above the tide is a shrine. But salmon-wise on the upper Cains it is essentially an empty shrine until the last two or three weeks of the season. The rest of the time, though, it has potential. We do have brook trout and an occasional kelt in the spring, and this time of the year we have the chance for a good look at the physical structure of the river bed, can observe all the various flora and fauna, and that includes watching parr and eating the wild rasberries that grow all over the river bank beside camp. This last week I helped Jason and Darrell scrape and paint the log camp, perform other needed maintenance, and also waded the river looking at the winter’s modifications to the gravel bars, and noted the presence of parr in the various shallow runs. I’m happy to report, as I’m also seeing in the Main Southwest Miramichi, that parr in various sizes are seemingly quite abundant. Watching them flit back and forth in the perpetual current, occasionally making a deliberate move for some microscopic tidbit, is always an uplifting experience. The warm water closure of most of the “cold water pools” on the river has been lifted, but I wouldn’t want to rule out a closure beginning again mid-week with the forecast warm temps and continued rainless conditions. Great writing, Brad, and very much enjoyed. Am interested in your Newfoundland comments. Cookie and I are going up/out in early September and hope to catch a late run on the Gander. Probably a long shot but will be enjoyable in any case. Bill – the ASF has been writing a lot about the low runs in Nfld, especially around the Exploits. Another friend fishes a fairly remote river over near the Serpentine that they really bushwack hard to get into. The number of fish they found this year was much less than they have normally run across. I wish I could do that for you. My group fished the Restigouche July 9-15 and did very well, landing over 20 fish up to 25 pounds including a couple good salmon on the dry fly. We saw lots of salmon every time out as well. Rains had bumped the river slightly higher and temperatures were mainly in the low 20’s during the day and around 10 Celsius at night (one night was 5 degrees!). The week before had decent fishing as well. 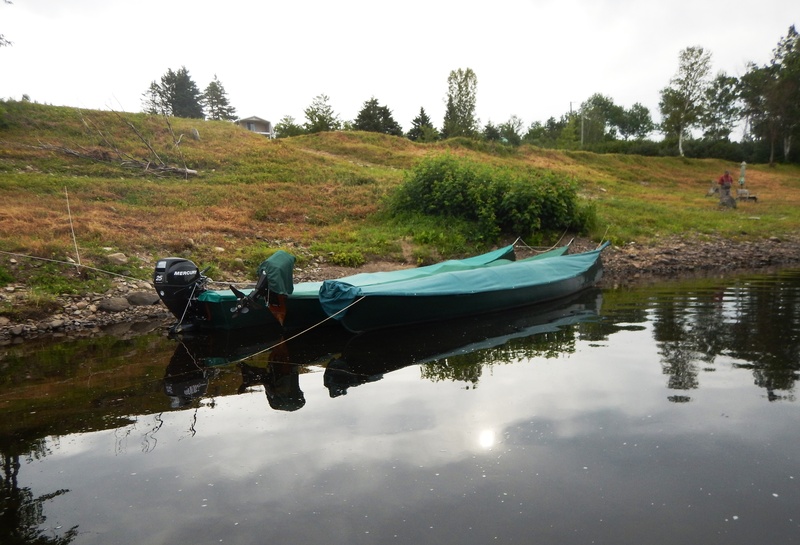 The river dropped by 30 cm during our week and kept right on falling so that the members the week of July 16-22 caught only one salmon and one grilse. Apparently the Petit Cascapedia was fishing very well during the same period we were on the Restigouche. Like the Miramichi system, the need for some steady rain over the next month is critical for the Restigouche and Gaspe rivers. I’m keen to do some fall fishing on the Miramichi and tribs so I’ve got an eye on the central NB weather and my fingers crossed. Tight lines all! We are forever waiting for water Brad. I’m joining friends for two days next week, Beat two Wednesday and nine on Saturday. There’s plenty fish but very reluctant to take unless we get a fresh drop. Doing a rain dance here for all. Like another commentator here, I am heading out SW Miramichi way in the fall – I actually have the dates Sept 23 to 29 or 30 marked in heavy pencil and being worked on by a very good egg we both know and by then it’s another country rainwise, runs and everything. Except its not (another country) – it’s the same beautiful river and the same cycle of life. My low water in Scotland last week was a reminder how it can render a salmon river weirdly empty. But perhaps too soon to even think in terms of low sea survival and await the unfolding of the summer and certainly in the UK those grilse can come really late these days, running in any bulk well into September and still going in October when of course some grilse are salmon-sized (7.5lb). I have fished the Miramichi every September since 1987. It’s my observation, hot, low water summers usually produce the best September fishing once the water cools to the high 50’s to low 60’s. Unless we have some unusually cool weather along with a good rise of water in August, this coming September should be very good fishing. I’ll bet there are a lot of salmon and grilse right now waiting in the estuary and bay until the water conditions are favorable. Earle – I don’t begin to have your history on the river, but I’m sure you’re right. The fish just aren’t going to enter the river in any real numbers in the face of that warm, low-flow water. A couple of weeks back I looked at my notes from last year, and after that early heat wave broke we had good fishing for a while in July. My records said that the water temperature was 58/59. We haven’t seen a day like that this year since mid June. Middle Drum is heavily dependent on those larger maiden fish too.